The Ripple Effect Wrap is an openwork scarf or shawl perfect for adding color and texture to your summer wardrobe while you to stay cool. The unique stitch work is made using an easy i-cord technique called Lattice Knitting. You can learn the basic technique and find more info in these YouTube lessons. The net-like fabric does not use a lot of yardage; a scarf requires only a single skein. 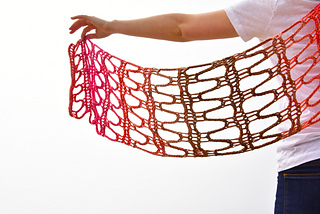 With two skeins, you can make a large wrap, ideal for the beach. Gauge: Gauge is explained in pattern. Skills used in pattern: Knit, KFB, K2tog, Slip sts back, This pattern does not have any purled sts.